Four Johns Hopkins undergraduate engineering students have designed and built a remote-controlled robotic vehicle to find deadly land mines in rugged terrain and mark their location with a spray of paint. The prototype has been given to professional explosive detection researchers as a model for a low-cost robot that humanitarian groups and military troops could use to prevent mine-related deaths and injuries. The project resulted from a challenge to the students by Carl V. Nelson, a principal staff physicist at The Johns Hopkins University Applied Physics Laboratory. Nelson had developed new sensors to help detect land mines, but he needed a device to carry these sensors into areas of thick vegetation where explosives are often hidden. He presented his requirements last fall to a team of students enrolled in the two-semester Engineering Design Project course offered by the Department of Mechanical Engineering at Johns Hopkins. "I asked the students to develop a vehicle that could get off the road, off the clear paths and go into rougher terrain like bushes and high grass, where mine detection would be difficult to do by hand," Nelson said. The need for such a device was clear. Nelson pointed to a United Nations estimate that more than 100 million land mines are deployed in 70 countries worldwide, planted during military conflicts dating back as far as World War II. The cheap but highly dangerous devices can be set off by civilians as well as soldiers, and more than 2,000 people are killed or maimed by mine explosions each month, the United Nations estimates. Nelson is one of many researchers looking for safe, efficient and relatively inexpensive ways to locate the hazards. To carry Nelson's sensors through rough terrain, the Johns Hopkins undergraduates designed a two-piece vehicle that rolls on tank-type treads. The front portion moves the robot, using two cordless power drill motors connected to a sealed lead-acid battery. Atop the drive segment is a color video camera, enabling a human operator to see what the robot encounters. The rear segment also is equipped with a small storage tank and a spray paint nozzle to mark the spot when a possible mine is located. The vehicle can spray about 40 times before the paint tank must be recharged. To guide the robot from a safe distance, the students constructed a battery-powered controller with a joystick to steer the vehicle. The controller also features a small video screen displaying real-time images from the robot's camera. When metal is detected, a "beep" is heard over a speaker on the controller or through headphones worn by the operator. A switch on the controller can then activate the paint sprayer to mark the spot. The robot's camera transmits video up to about 100 feet from the controller; the vehicle's movement can be controlled from a distance of about 500 feet. The robotic vehicle was built largely with plastic and other non-metal parts to reduce costs and weight. In addition, using non-metal parts avoids triggering false positive readings from the mine detector. The two-segment design also spreads out the robot's weight, making the device less likely to set off a mine. The four undergraduate inventors, all seniors, were Edoardo Biancheri, 22, of Rio De Janeiro, Brazil; Dan Hake, 21, from Wilton, Conn.; Dat Truong, 22, from Methuen, Mass. ; and Landon Unninayar, 22, from Columbia, Md. Hake, Truong and Unnimayar were mechanical engineering majors who graduated from Johns Hopkins last month. Biancheri plans to complete his undergraduate studies in December with a double major in mechanical engineering and economics. Working within a sponsored budget of $8,000, the students spent about $5,000 to design and build their prototype. They estimate the vehicle could be mass-produced for $1,000 or less, not including the cost of more sophisticated detection sensors. 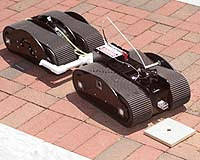 Nelson plans to show the prototype to his U.S. Army funding sponsors as a example of the type of low-cost mine detection robot that could help prevent death and injury worldwide. "I think the students did an excellent job," Nelson said. "They met just about all the requirements that I set out for them." The land mine detection robot was one of nine Johns Hopkins projects completed this year by undergraduates in the engineering design course. The class is taught by Andrew F. Conn, a Johns Hopkins graduate with more than 30 years of experience in public and private research and development. Each team of three or four students, working within budgets of up to $10,000, had to design a device, purchase or fabricate the parts, and assemble the final product. Corporations, government agencies and nonprofit groups provided the assignments and funding. The course is traditionally a well-received, hands-on engineering experience for Johns Hopkins undergraduates.